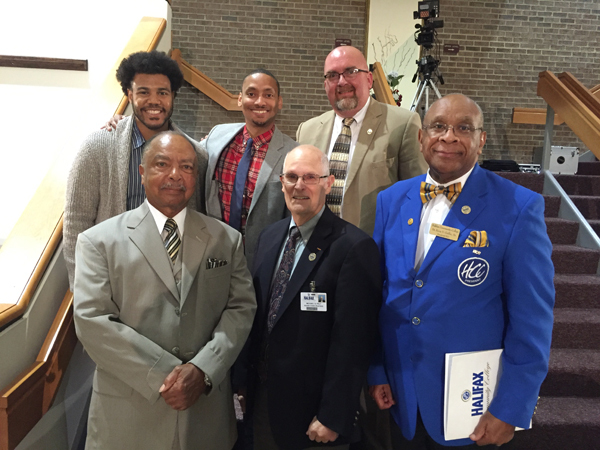 WELDON, N.C. – On October 27, Halifax Community College partnered with the Rev. Dr. Charles McCollum, president of the Southern Christian Leadership Conference, and Wes Tripp, sheriff of Halifax County, for a community-wide "Real Talk" event. More than 50 residents came to the session, voicing their concerns about the state of the community, and asking the questions that have been prominent in their minds. The Real Talk initiative, "Saving Our Sons and Daughters," was designed to foster dialogue between community leaders and residents about the issues that are facing their communities. From race relations to law enforcement, the session will allow residents to ask the difficult questions, and will allow community leaders to give the difficult answers. A key focus of the session is to provide a safe space for meaningful conversations. The initiative developed in an attempt to foster better relationships between law enforcement and the communities they serve. Utilizing the knowledge and experience of our community leaders, the goal is now for "everyone to get home safe," as communities come together for peace and justice. The event was hosted and moderated by the Rev. Dr. Charles McCullough. Panelists included Dr. Ervin V. Griffin, president of HCC, Gary Redding, instructor of English at HCC, Sheriff Wes Tripp of Halifax County, Wayne Terrell of the Roanoke Valley Early College and Michael Felt, chairperson of the HCC Board of Trustees. Halifax Community College strives to meet the diverse needs of our community by providing high-quality, accessible and affordable education and services for a rapidly changing and globally competitive marketplace.